"Kimmy Goes To A Party!" “Act like you belong, and the word is your oyster,” Titus tells Kimmy when they go to a fancy coffee shop neither of them can afford. That philosophy drives most of Kimmy and Titus’s action in “Kimmy Goes To A Party!,” a delightful and weird episode written by show co-creator Robert Carlock and directed by Nicole Holofcener (!). This time, the conflict belongs to Jacqueline, who throws an extravagant dinner party as a setup to try to catch Julian cheating on her. The stakes of that problem never seem particularly high, especially since we already know Julian is a bad guy and that Jacqueline is undoubtedly right to think he’s cheating on her. It’s hard to get emotionally invested in a marriage that we already know full well is broken. But the party acts as a great setting for the episode, which is contained almost entirely to Jacqueline’s home. Thanks to a makeover from Titus (“It is the pact between my kind and yours. And in exchange, you buy us brunch sometimes.”), Kimmy gets her Cinderella opportunity at the party. When she meets a rich and handsome man who assumes she’s another socialite, she decides to take Titus’s advice and pretend to belong. Kimmy’s interpretation of the rich and famous is hilarious, as she talks about PalmPilots and puts on an overly embellished laugh and gives her name as Kimberly Tiara VonLobster. So it works on a comedy level, but the whole episode is also an excellent attack on New York’s richest. Everyone is so fake and over-the-top that Kimmy’s fake and over-the-top persona doesn’t seem out of place at all. But Xan calls Kimmy out for pretending, threatened by the idea of someone like Kimmy infiltrating her wealthy world. Xanthippe is really the closest thing the series has to a villain right now, and even though Dylan Gelula is great as a slouching, nasty teen, it seems like the writers haven’t fully figured out what to do with Xan. As far as teen TV villains go, the best in recent memory is Chloë Grace Moretz’s Kaylie Hooper on 30 Rock. What made Kaylie work so well was her rivalry with Jack Donaghy and how evenly matched they were despite being so different on paper. There is no interesting edge like that to the tension between Xan and Kimmy, but the real problem is that we just don’t know that much about Xan, making her seem like a caricature of a mean teen. Her exchanges with Kimmy are undoubtedly great, especially as Kimmy’s burns have varying degrees of success. (“Hey Xan, 2090 called. You’re dead, and you wasted your time on Earth” scorches like fire.) I think what’s saving the rivalry for now is how committed Kimmy is to punching back every time Xan hurls insults her way. But Xan’s only purpose right now is just to pop up and say “I’m onto you Kimmy Schmidt!” from time to time, and the character deserves to be more. Speaking of those Kimmy disses, Ellie Kemper’s physical comedy has been one of her greatest strengths throughout the series, but she also deserves praise for the rich vocal work she does from episode to episode. Thinking back to the pilot, one of my favorite moments that I didn’t end up writing about was the voice Kimmy takes on when she’s applying to a job at the candy store. She overemphasizes her words, speaking as she believes a professional should. The voice returns a few episodes later when she answers “Kimmy’s professional work phone.” In “Kimmy Goes To A Party!,” Kemper again tries on different affectations as Kimmy assumes new identities. First, there’s the coffee shop, where she and Titus start speaking fake French to trick the waiter. But her interpretation of how the vapid one-percenters of Jacqueline’s party speak is even more hilarious, especially when accented with her posh chortle. Kemper plays Kimberly Tiara VonLobster with as much conviction as she plays regular ol’ Kimmy Schmidt. “Why do robots keep getting in the way of my dreams?” Same, Titus. Same. I’m hoping Titus’s new gig opens up some fresh storylines for the character. 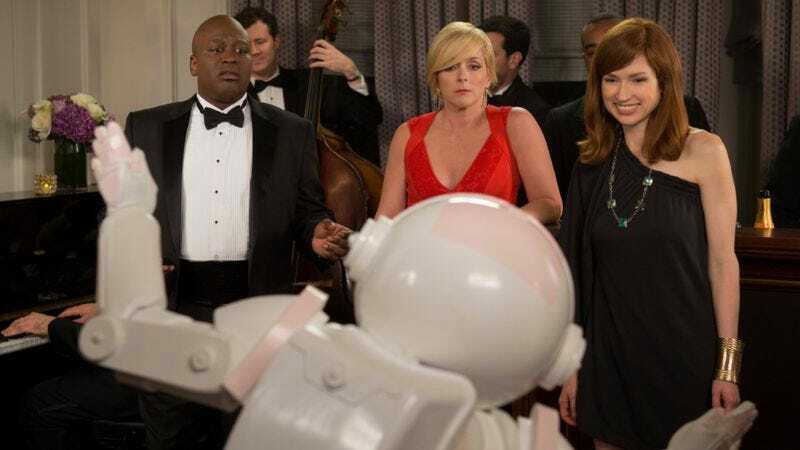 I know there’s a lot about this show that’s so 30 Rock, and it isn’t particularly interesting or novel to keep comparing the show to 30 Rock, but Yuko the robot is just so 30 Rock.